A fast and easy card for a friend impacted by the recent storm. Her mail box is filled with utility bills, and ironically, she waits for her home to be on the grid again. So, her friends set out to make some cards to make the mailbox a brighter place. 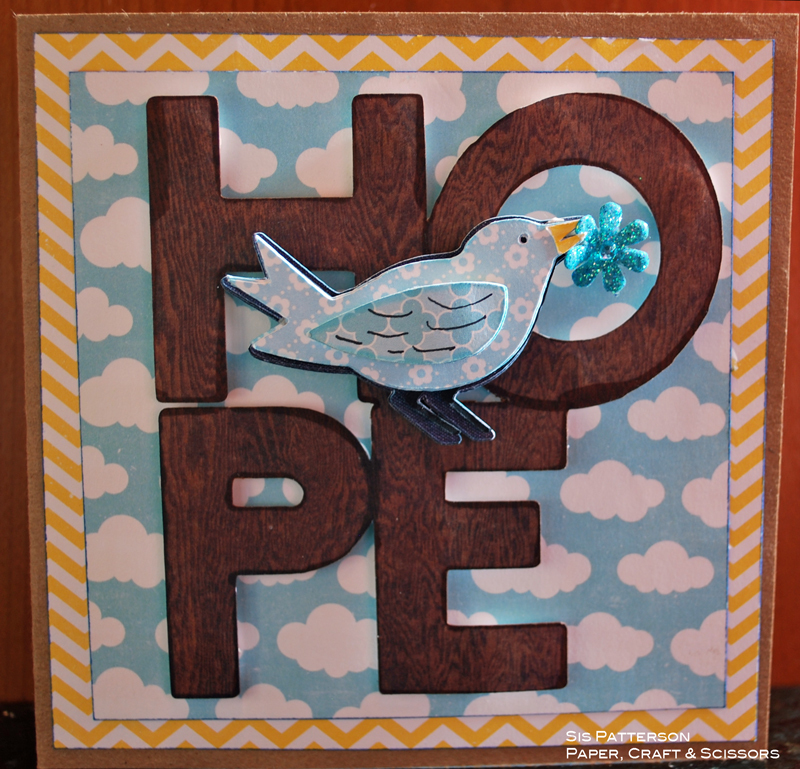 This is card uses Every Day Pop-Up Cards for the bird (at 1.5″ tall) and Cricut Craft Room Basic for the 2″ tall “HOPE” letters (the shadow feature). I used the Cricut Craft Room to weld the letters together after I had narrowed the “O” slightly as it is a super round “O” in the Craft Room. The “HOPE” is pop-dotted as is the bird and its layers. The bird has a small glittered flower in its beak. Most of the paper came from Echo Park’s Hello Summer paper. The completed card measures 5.25″ square. The first layer of background paper is 4 inches square, the second layer is 4.5″ square, and the kraft card base is 5.25″ tall by 10.5″ long (folded in a side opening card). I printed Emily Dickinson’s poem, “Hope” is the thing with feathers”, framed it with cardstock, and adhered it to the inside. This is such a kind and perfect project! I love the ‘sunny’ feel of it and the poem is the perfect choice. I am a sucker for blue skies with white clouds and faux bois…fantastic! Even your “simple” isn’t simple. What a beautiful and perfect card to do the job it is meant to do. Brings a little lump to my throat. So thoughtful and heartfelt…..a paper representation of you. Beautiful, Sis. Just beautiful. How sweet is this! I love the layers and dimensions you add to each project. I know this card will certainly brighten her day. Wonderful card and the perfect poem for the situation. I’ m sure it will be greatly appreciated! Beautiful! I am sure she will love this. Beautiful card — love the cheerful paper and all the details you put into it!! Beautiful card. The paper colors, the bird bringing hope and the sentiment I am sure will help cheer her. Sis, this is a beautiful, thoughtful card. I know it will raise her spirits and make her smile. She will feel your kindness the minute she opens it. I love the bird, it is a thing of beauty and hope. This card is just beautiful and I’m sure Gina will love it. The bright colors and the perfect sentiment is sure to brighten her day! Well, your card is absolutely beautiful…AND educational!! I wasn’t familiar with this poem so I had to look that up & then, I was pretty sure I knew what faux bois meant but I wanted to be sure…so I looked it up too! And now my noggin hurts from trying to absorb so much knowledge in 1 short day, so I shall have some chocolate ; P LOL!!! It really is a beautiful card & I’m sure that it will mean a lot to her! Beautiful card! I’m sure it made her day brighter :D.